Over the past few decades, there have been numerous attempts to recreate the original Lakhovsky MWO device. 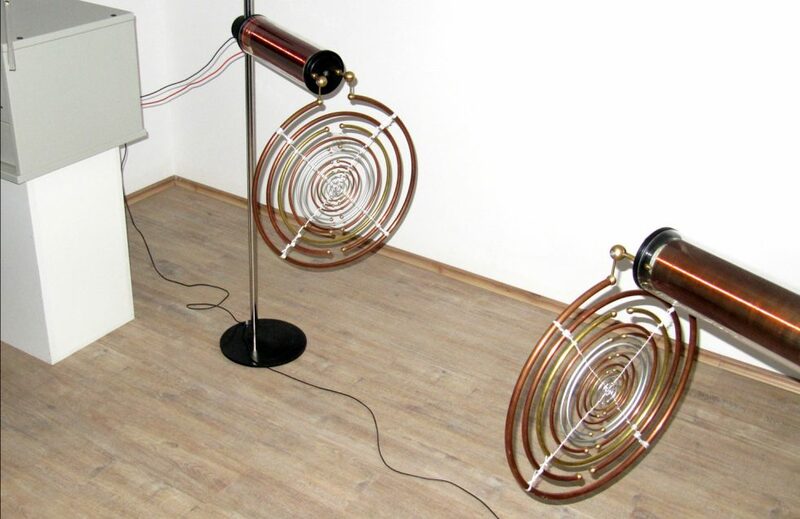 Some of the MWO devices that were a result of such efforts are quite inventive and imaginative. However, regardless of the rumours of their medicinal efficiency, they were all just educated guesses as to how exactly the actual device worked. It all changed when several original and several still functional Lakhovsky MWO devices were discovered in Italy. Through the efforts of two curious engineers Bruno Sacco and Tony Kerselaers, those devices were meticulously analysed and reverse engineered. They published their findings in the e-book “The Lakhovsky Multiple Wave Oscillator Secrets Revealed” which can be ordered from their website http://users.skynet.be/Lakhovsky/Secrets Revealed.htm. We highly recommend reading this eBook thoroughly to all who are interested in historical materials regarding the original Multiple Wave Oscillator device of Dr Lakhovsky. It is virtually the only reliable source of historically and technically available data on the original MWO devices..
We manufacture premium quality historical replicas such as the Lakhovsky Multiple Wave Oscillator model BV2. However, we do not make any claims of possible bioactive and medicinal effects. It is the responsibility of a user to observe necessary caution and pertinent safety and to comply with EMI/RFI regulations. 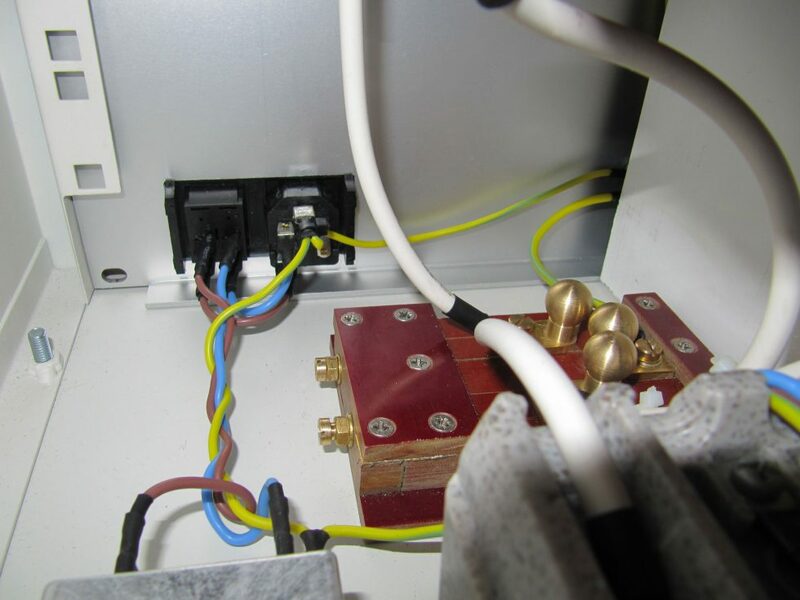 For a Multiple Wave Oscillator to operate correctly and safely, it is the user’s responsibility to ensure adequate electrical installations and earthing (grounding). Based on the reverse engineering report, we designed an MWO replica that closely matches the specifications of the Lakhovsky’s original Multiple Wave Oscillator BV2 device. 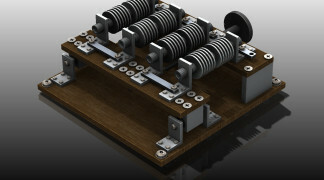 Modelling of all design elements of Multiwave Oscillator is done using 3D CAD software. That enables us to promptly modify the design to address real-life problems encountered during machining and assembly process immediately. 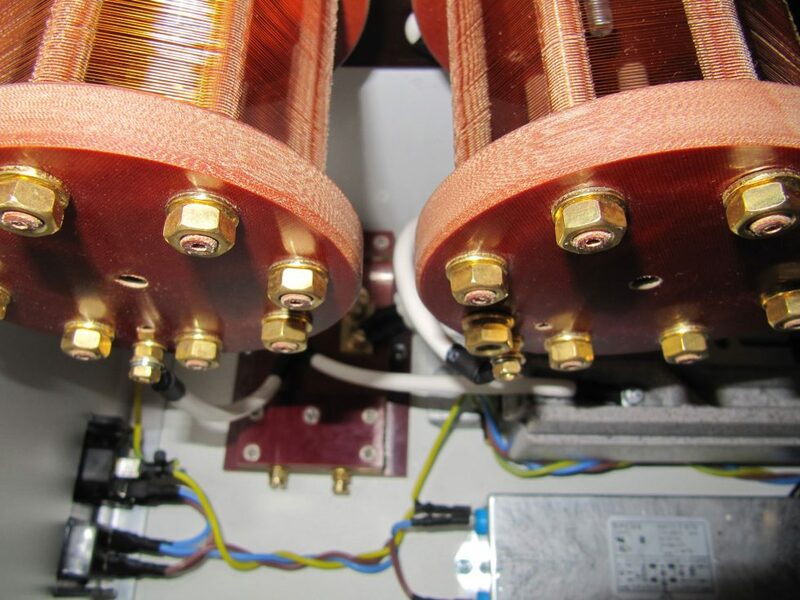 All electrical key components such as contactors, high voltage capacitors, high voltage transformer and high voltage wiring we select in such a way to ensure at least twice the nominal rating necessary for reliable operation of the device, thus extending the lifetime of the components. The historical device was practically never used in excessive power output, and effluvia were deemed detrimental to the proper operation of the device (as it turns out with good reason). We decided to employ protective circuitry and also to limit maximum output power to within values that were historically used in treatments of patients. In such a way, the longevity of the components is ensured, and the device operates within the standard parameters that were originally used in historical treatments of patients. It is possible to re-adjust the circuitry to allow for maximum power output, but we do not see any rational reason for doing so. We use custom-made steel modular racks to house the internal circuitry. The rugged design of the enclosure protects users from accidentally touching the high voltage components. It also protects the components from accidental physical damage. 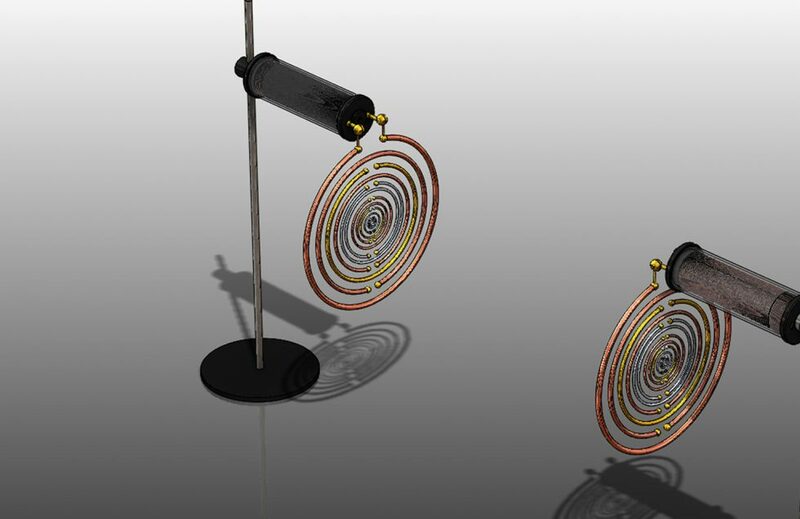 We are confident that our Multiple Wave Oscillator replica can easily endure the most severe impacts. 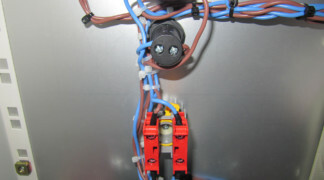 Individually removable panels allow for quick access to the main components of the internal circuitry. 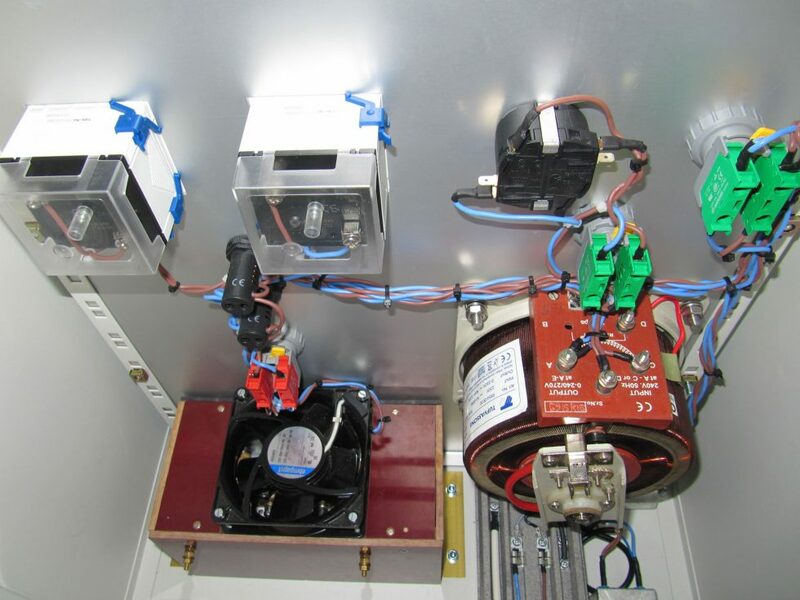 Due to the modular nature of the enclosure, it is possible to retrofit Lakhovsky MWO replica with additional circuitry and instruments as per request. We used digitally printed decals on our early prototypes for the sake of simplicity. However, all subsequent devices incorporated engravings of the metal panels. What is more, the spark gap adjustment knob is now replaced with turns counting dial to provide a more precise and reliable adjustment of the distance between the spark gap electrodes. 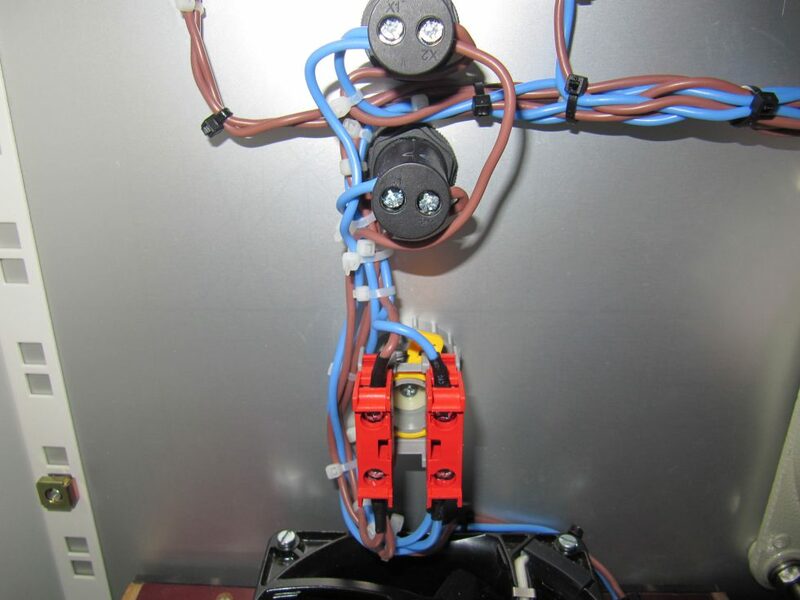 Although it is not necessary for the functional operation of the MWO, a lot could be said about the way the coil assemblies look aesthetically. We take special care to design our Multiwave Oscillator replicas in such a way to make them aesthetically appealing (also see the heavy duty version of Multi Wave Oscillator). 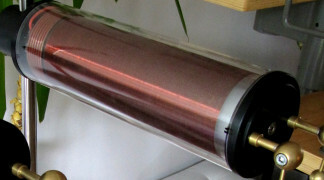 With that goal in mind, we wind Oudin coils on precisely machined transparent Plexiglas tubes (Frequently confused! 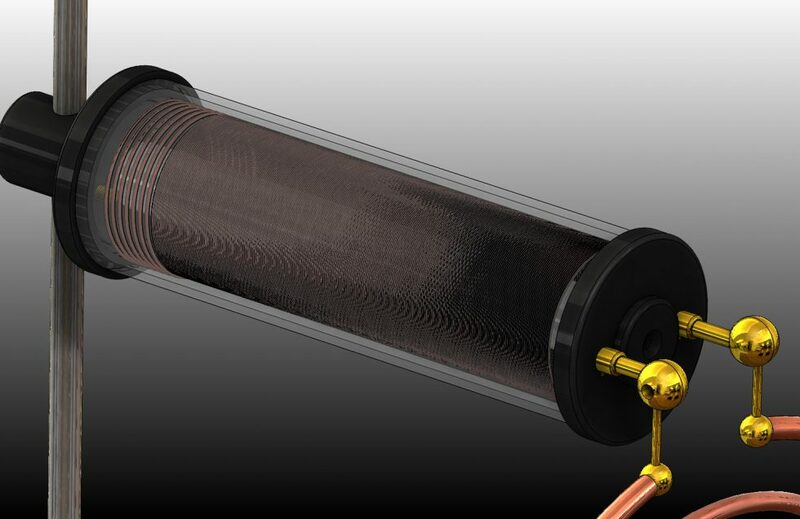 – MWO uses Oudin’s coil design rather than Tesla’s). 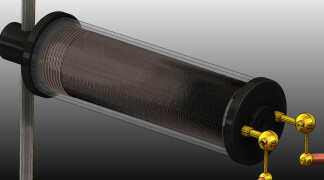 Such tubes ensure precise distribution of windings and mechanically compact design. 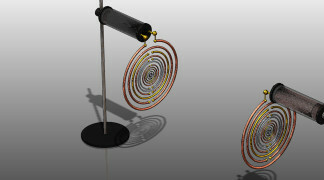 We believe that it gives the coils a somewhat modern look. 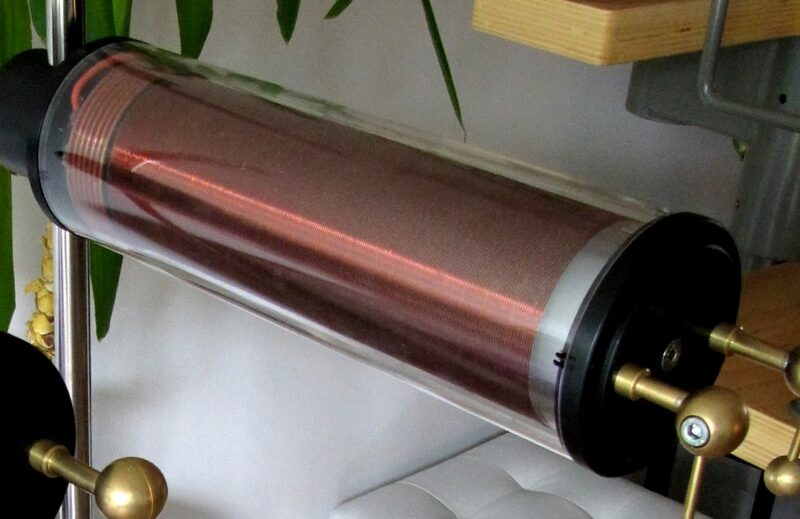 Another transparent Plexiglas tube that encloses the entire coil protects from accidental mechanical damage, prevents the appearance of electrical corona discharge (in addition to layers of polyurethane varnishing applied to the surface of the coil itself). 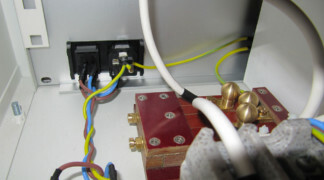 We mount the sub-circuits on separate modules. Such design considerably simplifies assembly, testing, modifications and replacement of the key components. Based on our experiences with the initial design shown in the photos and the video below, we have additionally improved the design of the main components. 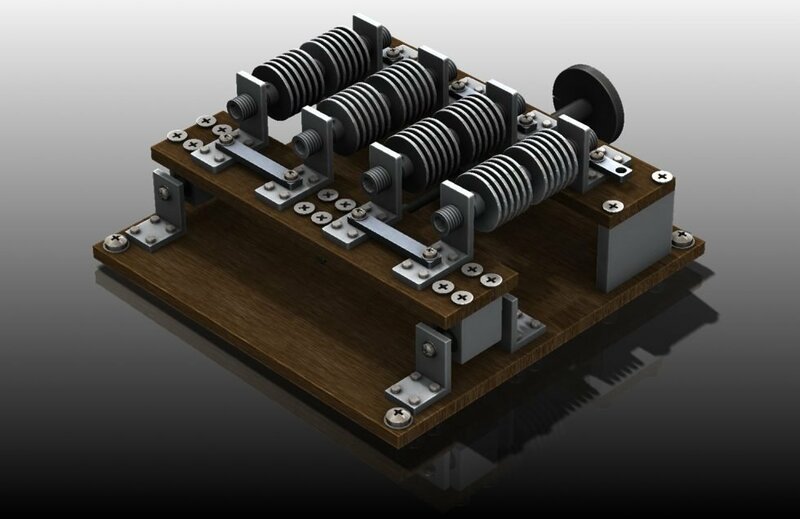 Since our entire coil assembly design is easily replaceable, it is now possible to manufacture separate coil modules that can produce the desired set of resonant frequencies. 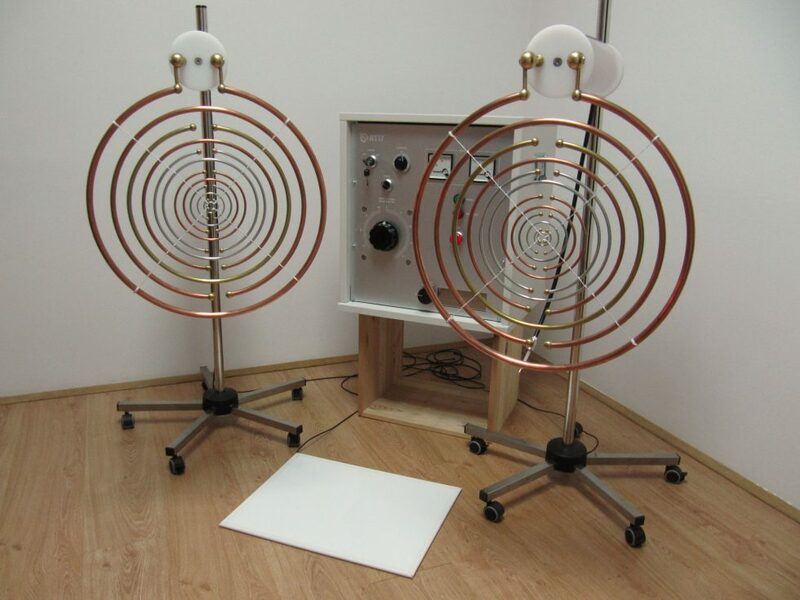 Therefore, there is a possibility to make additional coils tuned to a different set of resonant frequencies, which allows users to experiment with different resonant frequency relationships simply by replacing coils. We can make different types of spark gaps. Compared to other types of spark gaps used in the original Lakhovsky MWO devices, there are no apparent functional differences. The V-type spark gap is better suited for continuous operation in spark quenching mode due to a larger surface area of the electrodes. However, such an advantage comes at the expense of greater weight and inability for easy replacement of Wolfram electrodes. Due to the modular design of our replica, both types of spark gap are easily interchangeable with no additional adjustments needed. Treatment procedure of historical Multiple Wave Oscillator devices often required the use of specially designed hand-held instruments and footpads. 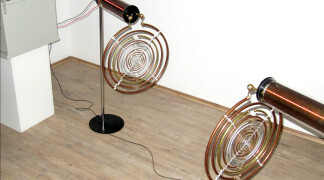 Such instruments were often placed in direct contact or proximity to the treated region of the body and were used to shape (“focus”) geometry of the oscillating dielectric field. Because we deem those instruments to be one of the crucial parts of the historical MWO treatments and for the sake of historical accuracy we also produce those tools. They are an integral part of the historical Lakhovsky MWO replica set. Based on our experience, we continue to improve on the mechanical design, machining procedures and even aesthetics of Multiple Wave Oscillator replicas that we produce. 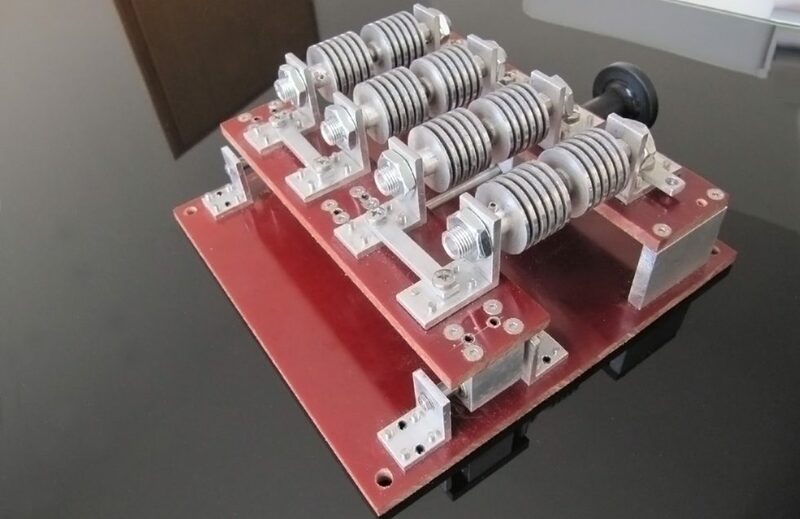 Are you looking to buy a Multiple Wave Oscillator replica? For more information and price quotations, please contact us by email. 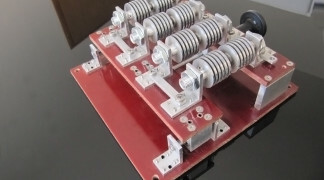 Did you know we also offer the heavy-duty version of the Multi Wave Oscillator replica for sale? The main differences between the versions are MTBF (Mean Time Between Failure, 15.000 – 25.000 operating hours), the capability of operating for prolonged periods in succession (with much shorter pause); and the ergonomics. Hi Roberto, thank you for contacting us. We are located in Zagreb, Croatia. The requested information has just been sent to you by email. Hello Sumo, thank you for contacting us. We have sent all the information regarding the Lakhovsky MWO replicas to you via email. We don’t sell the eBook “The Lakhovsky Multiple Wave Oscillator Secrets Revealed”, but you can inquire about it on the following URL http://users.skynet.be/Lakhovsky/Secrets%20Revealed.htm. Hello, I would like to know about the price of standard and heavy Duty MWO and also the price of an ebook. And how standard is different from heavy duty? And how much for shipping to India? Thanks. Hello Juan, thank you for your interest. The information has been sent to your email address. Hello, It seems to be a good replica. Please send me the price. I live in Spain. Can you also send me the cost for shipment? Hello Paul, thank you for your interest. We’ve just sent the pricing information to you via email. Very curious, please send me prices of your replicas. Hello Michel. We just did. Hello Marian. Please check your email. Hello Rhonda. We’ve just sent the requested information to your email address. Hello Clement. We do have in offer custom made components for MWO. You will receive all the information via email shortly. Hello, I’m Clement Hajian from Brasil. Could you please tell me the price of the MWO? And if you also sell parts? Like only antennas and bobine, and how much it cost? Thanks! Thank you for your kind words. We responded to you via email. Thank you for your inquiry. We responded to you via email. Please send me the price and shipping to Texas, in the US. What is the price of the standard and heavy duty machines? Hi Blanca. We’ve just responded to you via email. I would like to know what is the cost of the machine and transport to Spain and how different is this model from a heavy duty one. If you have the information in spanish. Hello Rocky, please check your inbox as we’ve just replied to your comment via email. Hello James. The info you’ve requested has just been sent to you by email. Could you please provide me with details of the cost and shipping to the UK for both devices? Thank you for your dedication and cont8nued research. Hello Aj. We’ve just sent the pricing information to you via email. We just forwarded the email to you again. Please check your inbox and your spam folders. I’m interested to buy one of your MWO, can you send me price and shipping to south korea? I didn’t find your reply in my email box. Please resend your reply to me. Hello. We responded to you via email. What is the cost including shipping to send one of these to Texas in the U.S.? Hello. We just replied to your enquiry via email. Hello! We responded to your comment via email. I would like to know what is the cost of the machine and transport to South Korea. What is the price and availability? Hello Ekhart, we’ve just sent the information to you. Hello, I’m interested to buy one of your MWO, can you send me price+shipping to Poland? Hello Vincent. We just emailed you the information you’ve requested. Hello, I would also like to know more about this device and pricing. Thank you! Hi Mike. Please check your inbox as we just responded to you. Hello Justin. We just emailed you all the information. Could you email me the price for one of these? Hello Lauren. We responded to your price quotation inquiry via email. Hi Jason. We responded to you via email. Hi, how much for this device please? Thank you. Hello, would like to get the price for the device and shipping to Canada, BC. Also, could you let me know your opinion on BioCharger NG? I read all about it, but still, have no clue how to compare as this company doesn’t provide too many details. Thank you! Hi Mick, thank you for your inquiry. We responded to you via email. Hello James. We responded to you via email. How much is the MWO with shipping to the USA? Hello Chlytie. Our replicas are custom made and their prices vary depending on buyer’s requirements and place of delivery. Hence, the prices are not posted here. Please check your inbox as we’ve sent the information you requested by email. Why is price not posted? Can you please send me pricing? Thanks. Hi Martha! We responded to your inquiry via email. Hi! Please send me pricing info. I’m in the uk. Thank you! Hi, we’ve sent all the information to you via email. Hello Dan, please check your inbox. We’ve just responded via email. What is the price of your replicas? Do you have any products available for enhancing plant growth? What is the price for your standard MWO? Hello Linda. Please check your email. What is the price of this device? My husband and I want to buy one as soon as possible. Hi Josh. We just responded to your inquiry via email. Hi Peter, that is a very interesting observation indeed! Hi, With the assistance of Peter Lindemann (via telephone) I built the MWO Peter describes in the MWO Handbook. Results were nothing short of fantastic. One interesting thing that happened was that numerous cats started showing up in front of my living room window whenever I ran the MWO. 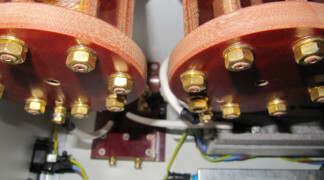 I was running a 9.5kv neon sign transformer, and the spark gaps made a lot of ozone. So I used some four inch clothes dryer exhaust conduit with a whisper fan to blow the ozone out through a window screen. Was I ever surprised after a session with the MWO to go outside and see at least five or six cats, maybe more, all sitting politely in front of where the ozone[???] exited. Word must have got around because more and more cats started showing up. One night a group of cats began making just one heck of a racket meowing away like crazy. It took me a while to realize they were demanding I turn on the MWO! Exposure to the ozone[???] made by the spark gaps had certain other very interesting effects on the cats! The MWO was lost under adverse circumstances. Please send pricing info on your device. Hi Janet, please check your email. We responded to your inquiry. Hi Dan, we’ve sent all the information to you via email. Hi please send me your price to purchase a unit. Thank you. 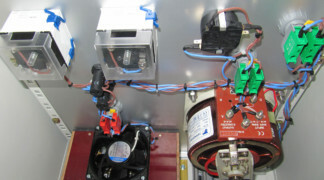 Hi – can you provide me a price quote for a system to NJ. Hello, we’ve just responded to your inquiry via email. Can you give me more product information including the price? Hi Villenave, we just replied to your comment via email. I’m a french therapist. Would you mind please send me by mail the price with post cost? Hello Frank, thank you for your inquiry. Please check your inbox. Hello Nada, we can arrange for the shipment to Canada. All the details have been sent to you via email. Hello Daniel, we do manufacture MWO components. Please check your email for details. Could you please send me information about pricing and shipping to Germany? Do you ship to Canada, and if you do, how much would be the MWO + shipping? Hello, I’m Daniel Vazquez from Spain. Could you please tell me the price of the MWO? And if you also sell parts? Like only antennas and bobine, and how much it cost? Thanks! Hi Ken, we just replied to you via email. We don’t do any treatments. We manufacture premium quality MWO replicas that are in every significant aspect virtually identical (frequency content, output power, signal envelope, phase reversal, concentric antenna etc.) to the original device model BV2 that was produced between 1933 and 1940. 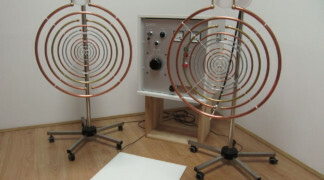 However, the most comprehensive practical and theoretical research on bioactive effects of Lakhovsky’s Multi Wave Oscillator and clinical treatment of various diseases is published in an eBook “Biological Effects of Exposure to Multiple Wave Oscillator Fields” by Tony Kerselaers (http://users.skynet.be/Lakhovsky/BEM.htm). Hello Gary, please check your inbox. Hi, we replied to your inquiry via email. Thank you MariPia. Please check your inbox. Hello Oliver, we just responded to you via email. Hi I am interested to learn of the treatment protocol and also the price of the machine shipped to Malaysia? 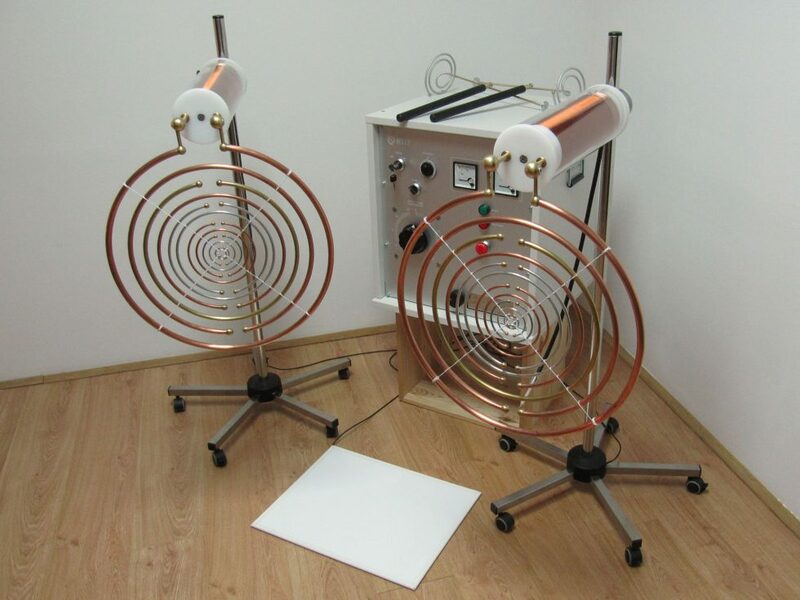 Have you done many treatments with this machine? If so, what are the results? Thanks. Hello, I’m interested. Please send me more info including pricing, options, etc. Hello, please send price information for U.S.A. Thank you for your research and dedication. I am interested in buying a MWO from you. could you please send me information about pricing and shipping? Hi Jim, please check your inbox. hi, price please. U.S Ohio thank you. Thank you Dean. We just sent the product information to you via email. Hi Kenneth, please check your inbox. Hello, we just replied to you via email. Hello Bridget and thank you for your suggestion. We just responded via email. Hello Terrence, please check your email. We just responded to you. Interested in buying one from the best source. Could you email me with the price comparison of the 2 units? I would also like to know the cost of the MWO and if you answered publicly, you wouldn’t have to respond to so many questions about it. I am interested in a demonstration or therapy in the McAllen Rio Grande Valley area with purchase later. Where are any units available and how much is minimal cost? Hi Brent, we just responded to you via email. How much is the MWO shipped to USA? Hi Sergio, thank you for your kind words. Please check your inbox. We just replied to you. Hello Josh, we just replied to you via email. Hi guys. Got delighted with what you are doing. Please can you tell me if there’s any feedbacks about effectiveness of your machines. Would like to order then if it’s possible. Spain. Thank you. How much is it for a device?? Hello Ray, we just responded to your inquiry by email. How much is the standard model with shipping to the USA? We will reply to you via email ASAP. Thank you for your patience. Sorry for the delay in responding. We will reply to you via email ASAP. Thank you for your patience. Can you please provide pricing for both. Delivery to Brisbane, Australia. how different is this model from a heavy duty one? Can you please provide pricing for both. Delivery to Sydney, Australia. Hello, we just replied to your inquiry via email. I would like to have one WMO, how much is it? I would like to know what is the cost of the machine and transport to Switzerland. Thank you for your enquiry. Reply via email. My question is whether or not the Lakhovsky MWO could be used as a short distance FM carrier wave for communications? If so, then (FCC aside), if a total restructuring of how we communicate would happen, it could be even beneficial to have a modified cellphone up next to your head! 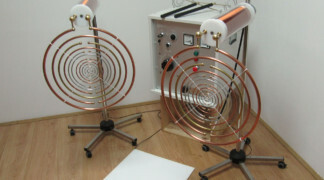 More repeating towers would be necessary, to continue the longer wave FM signal transmission over greater distances, though each tower would be transmitting a harmonious, healing MWO carrier wave to the surrounding environment. Please, do share with me your thoughts on this webpage I’ve put together. Thank you.